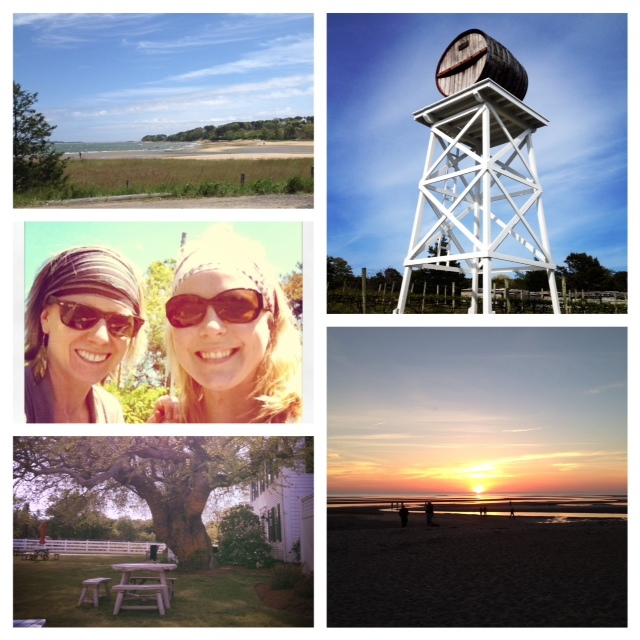 Last weekend I went up to Chatham, Massachusetts to visit one of my very best friends. 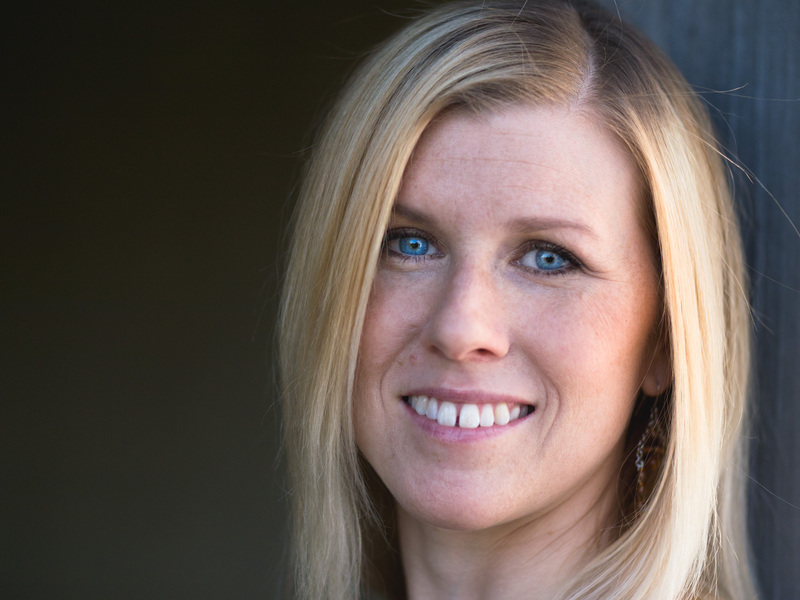 Stephanie moved out to Cape Cod about 3 years ago after meeting the love of her life. They just bought a house in Chatham and have been settling in. Though we have seen each other many times since the move, we realized it had been a while since we celebrated our birthdays together. We used this as more of an excuse for me to come up and see the house, celebrate our 27th birthdays (again), catch up on life, and eat everything we wanted to our hearts content! Which is exactly what we did from the moment I arrived until the moment I drove off Monday morning. “I’m on the Cape!” I joyfully yelled up to Stephanie looking out her window, welcoming me to her new house. She gave me a tour with all the new renovations and it looks great. The house was a real fixer-upper and she and her boyfriend, Jamie, are doing an amazing job. On the ride up I stopped over at Sugarbelle and picked up some cupcakes. It was our birthday celebration after all! With no hesitation we opened the 4-pack box to try the Cookie Dough. The other 3 were a Red Velvet, Peanut Butter Ganache, and my favorite, Old Fashioned. We didn’t eat them all right then, but they were gone by the evening. Our afternoon was spent on the beach in hooded sweatshirts since it was incredibly windy. The day was much cooler than expected, but the clam chowder we got for lunch at Chatham Fish Pier Market warmed us up. As evening rolled around, we got ready for dinner at one of my all time favorite restaurants, Local Break, in Eastham. Stephanie had never been and I had been hyping it up for weeks. Local Break is set around the backside of a plaza so it’s not that easy to see coming up Route 6 East. It’s a hidden gem in my opinion. We sat down at a high top table and looked over the specials and drink menu. Stephanie ordered a Prosecco Cocktail made with St.Germaine, club soda, fresh lemon, and Prosecco. 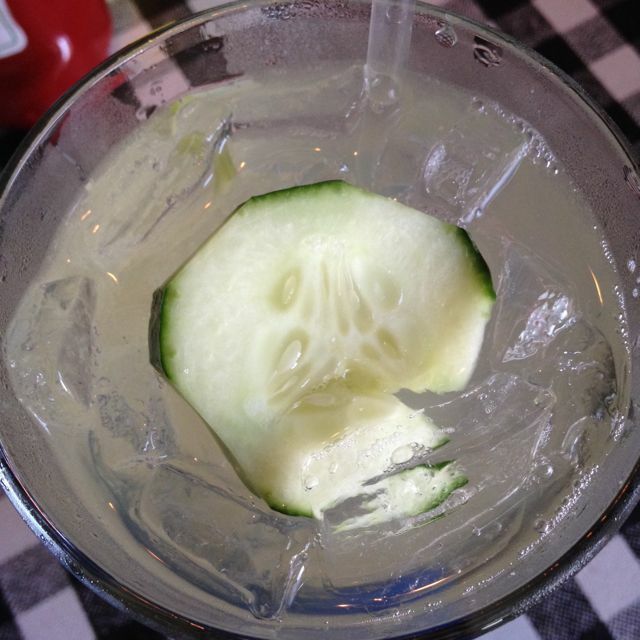 I tried the Thom’s Cucumber Collins made with house infused cucumber gin, ginger ale, splash of sour, and fresh cucumber. Both were very refreshing. The meal started with a Cucumber-Watermelon Salad that had fresh dill, miso dressing, crispy wonton strips and toasted sesame seeds over a bed of arugula. The salad was fresh and sweet and went nicely with salt from the miso and bitter greens. Another appetizer we selected was the Short Rib Tacos. They serve two huge portions which could be considered more of a meal instead of an app. The braised shredded beef was piled high on a soft tortilla with tomatillo salsa, avocado, and chili sauce served with a grilled radicchio and corn salad with a creamy dressing. We could have stopped here, but no, we kept going. Onto the entrées! We were lucky to get the last one of the Scallop Special. A bed of rice with black beans and black-eyed peas was surrounded by a creamy roasted tomato and goat cheese sauce. The perfectly seared scallops floated in the sauce and carrots lay over the top. The sauce was exquisite. If there was bread on the table, it would have made its way into the bowl. The other entrée had a completely different flavor profile all together. The Roasted Shrimp served with orange scented quinoa, curried peach puree, bok choy, and grapefruit segments was much lighter. I loved this combination: creamy quinoa, tangy grapefruit, spiced peach with very simply prepared fresh shrimp. Brilliant. Unfortunately, there was no room for dessert, so we took some tacos home for Jamie and called it a night. The weather was bright, sunny, and much warmer than the day before. After drinking a delicious dark roast coffee that Jamie graciously bought for me, Steph and I got ourselves ready for breakfast at the Keltic Kitchen. Authentic Irish music played in the background as we sat down at a dark wood 2 top table. It was like being in an Irish Pub. The menu consisted of traditional Irish breakfasts, Irish twists on the classics and some unique specials. Steph had their Lemon Blueberry Ricotta Pancakes before and was raving about them. I anticipated ordering those until I saw everything else: Famous Corned Beef Hash, Mango Kiwi Pancakes, Bacon, Apple and Cheddar Potato Pancakes, and the Keltic Scramble, to name a few. 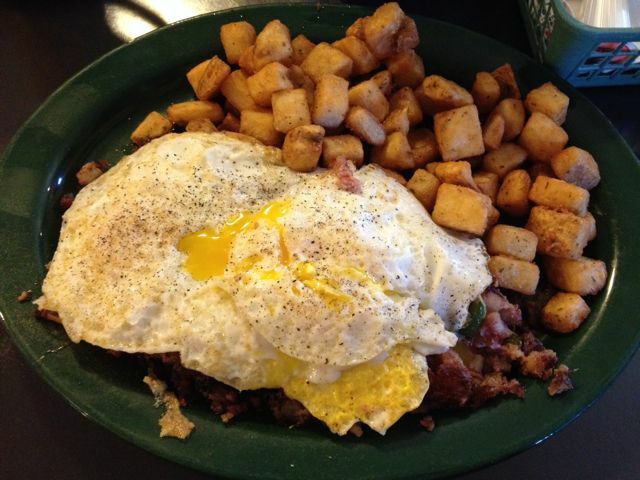 I decided to keep it traditional and ordered their Famous Corned Beef Hash. Stephanie decided on the Ham, Spinach and Brie Omelette on their Specials Menu. The generous portions were hearty and filling. We didn’t leave much left on our plates. After a satisfying first meal of the day, we headed into downtown Chatham to do some much-needed walking around. We stopped into some clothing, jewelry, and craft stores along Main Street and “accidentally” fell into the hustle and bustle of the Chatham Candy Manor. This small candy and fudge shop is always packed with locals and tourists looking to satisfy their sweet tooth. A small park is close by where they have local art events throughout the summertime. We walked through and found a bench to sit on and sampled a white chocolate covered Oreo while soaking up the sunshine. When sun and shopping were done, we dropped off our bags at home and headed up to Truro. Right on the corner of Route 6 and Route 6A (the scenic drive to Provincetown) there is a vineyard. Truro Vineyards offers wine tastings and has recently added a Rum Shack. Also new to the mix, Blackfish Restaurant sets up a food truck presenting a small selection of creative eats. The vineyard itself produces their own Chardonnay, Merlot, and Cabernet Franc and sources other varieties of grapes from premium vineyards. Some of the wines come in their signature lighthouse bottles that you can find at liquor stores throughout the Cape. We thought this would be a good place to kick back and have a late lunch/early dinner. 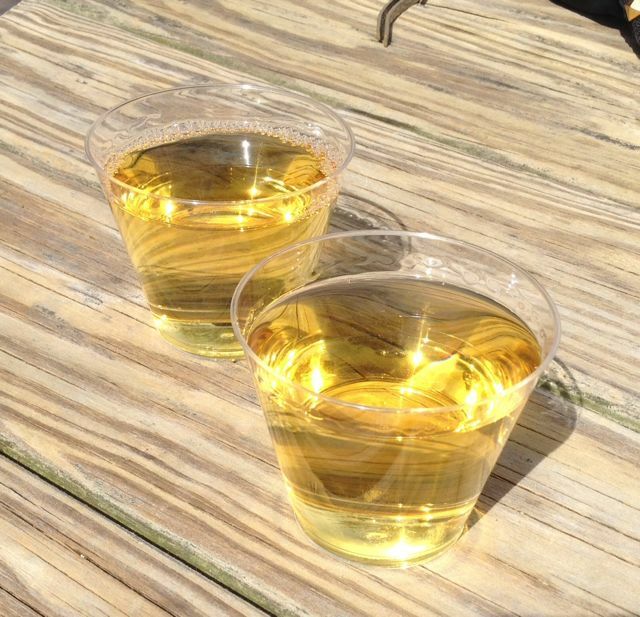 We purchased 2 glasses of their Vignoles wine at the Rum Shack. Vignoles is a semi-dry white wine with flavors of tropical fruit and spiciness. We sipped our wine while reclining in adjoining Adirondack chairs and enjoyed the scenery. Getting too caught up in conversation, we noticed that the food truck was shutting down. Maybe next time we’ll get to sample their Pork Belly Tacos, Kobe Beef Hot Dogs, or Lobster Sliders. Now where to go for dinner? Light bulb! Stephanie remembered the Rock Harbor Grill in Orleans. 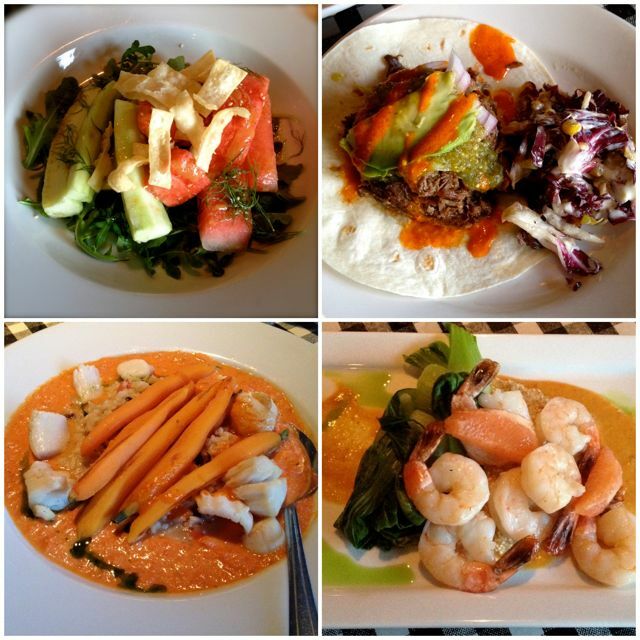 It was voted one of the best new restaurants by Cape Cod Magazine last month and after being there, I know why. Next to Local Break, this became one of my favorites. The menu was broken down into small, mid, and main plates, along with sides. They also have a full gluten-free menu. I tried one of their signature martini’s made with grapefruit vodka, habanero syrup, and cranberry and lime juices. Just the right amount of sweet and tart with a kick! Neither of us were feeling up for a main course and settled on small and mid plates to share. Alright, I confess. I had another small piece. Soon after, we got our skillet of RHG Poutine which consisted of sweet potato fries, Montreal smoked beef cut like thick strips of bacon, smothered in melted cheddar curds and Pommery mustard gravy. 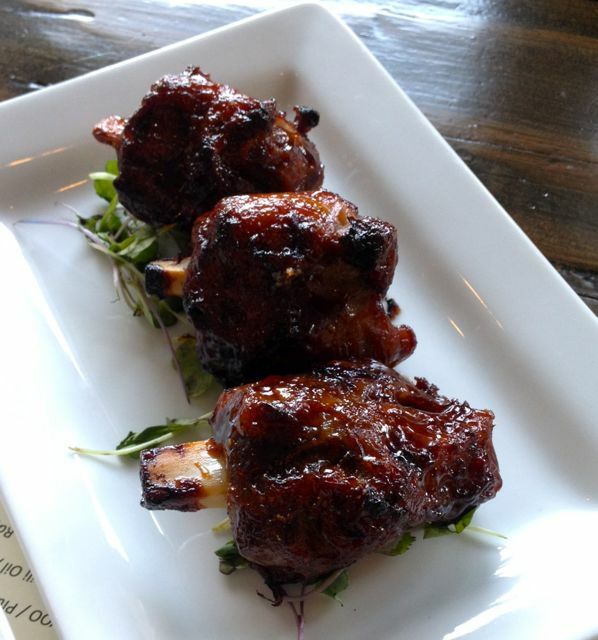 The BBQ Pork Wings came on a plate with 3 braised mini pork shanks covered in a citrus-chipotle glaze. What better to go with those wings than a side of the Jalapeno Cornbread with Smoked Cheddar. Not much was said at the table between us except for “mmm” and “so good!” with occasional nods of approval. As if we didn’t indulge ourselves enough, we chose to look at the dessert menu. The one that stood out the most was the Toffee Pudding. I was hesitant seeing that it was bread pudding. With a quick twist of my arm, my partner in crime became a bad influence. (Just kidding, Steph!) 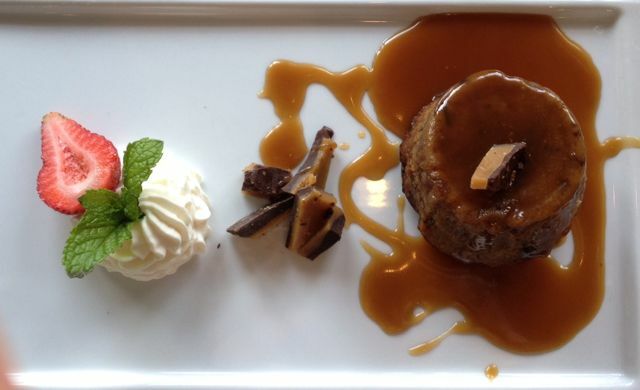 The Toffee Pudding was served warm with chocolate on the bottom, covered in a caramel sauce and toffee pieces. Let’s just say we ate all of it in about 30 seconds (except the toffee pieces which got super-glued to our teeth). The portion was just enough to satisfy the need for something sweet without being over the top. 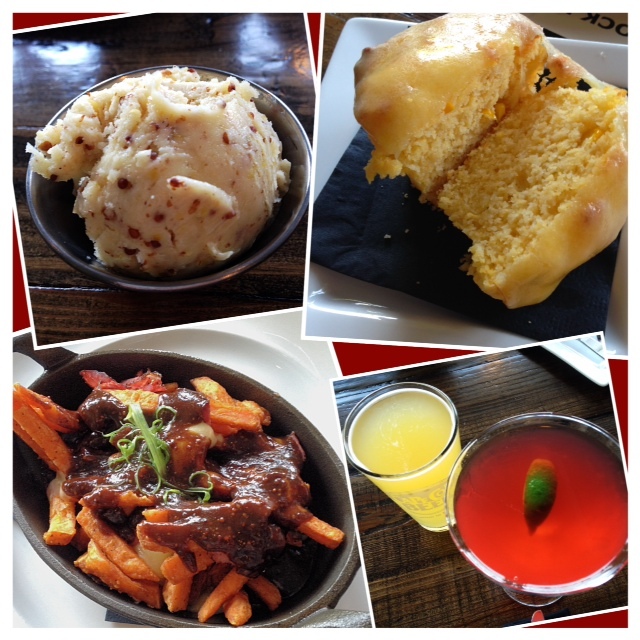 Rock Harbor Grill was a fantastic food experience. I will definitely return to try more of their delicious plates. To end this wonderful day, we drove over to First Encounter Beach to watch the sunset. With over an hour till the sun was down, we walked along the beach. It was a low tide so you could walk really far out into the bay. As we were getting closer to the dry sand again, Stephanie noticed something walking around. 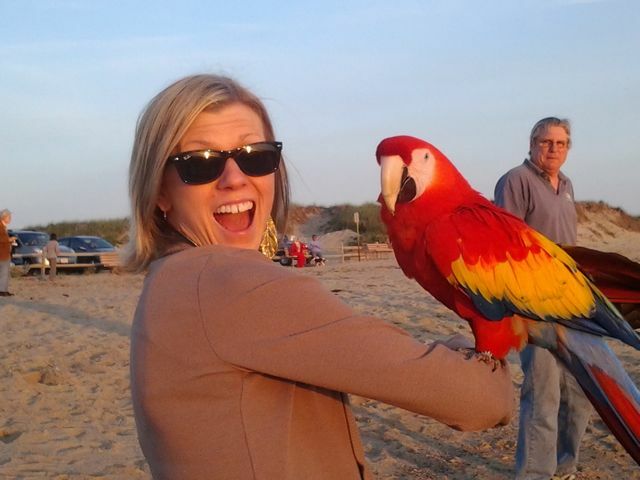 She said, “Is that a parrot?” It sure was! If you can’t tell by the photo, I was just a little excited to hold him. Such a random and incredible moment to cap off our Sunday Funday and my last night on the Cape. Many, many thanks to Stephanie and Jamie for having me for the weekend. You are a wonderful couple and gracious hosts! Until we meet again Cape Cod!